The vision of Synaptic Global Learning (SGL) is to provide the highest quality technology enhanced and individualized in-class and online distance learning classes and programs, using the latest brain-based research. SGL wants to make significant changes in the way education is delivered online by providing personalized learning interfaces. Synaptic Global Learning is seeking a creative, self-motivated marketing candidate to help coordinate and execute the company’s marketing, communications, and sales programs. Marketing Assistant will work as an integral member of the Sales & Marketing team by assisting, with, the development and implementation of marketing strategy. As well as serving as the point-of-contact and direct sales to prospective customers. This position is a potential to become a regular full time opportunity, upon satisfactory performance review. We’re seeking ambitious candidates who want to begin a career in a challenging, rewarding environment. Assist in the design, development, and maintenance of marketing materials to support the company’s sales and marketing efforts. Responsible for executing mass mailing initiatives including direct mail and email campaigns. Bachelor’s degree or final year in Marketing, Communications or related field. Knowledge of HTML, Google Analytics, and Google AdWords. Knowledge of social media, for sales and marketing. Willingness to learn and execute sales and marketing strategy. Strong phone and face to face communication skills. Disposition to acquire adaptive learning. The ability to work well individually and as a member of a group. Good judgment, a positive attitude, and a willingness to take initiative. To apply for StEP internships, please send your cover letter and resume to vdc@umb.edu. These are the MAP Events for the week of January 26, 2014. Military Veteran Event: Starts at 10:00 AM at the State House in Boston. MAP Miles earned: 50. 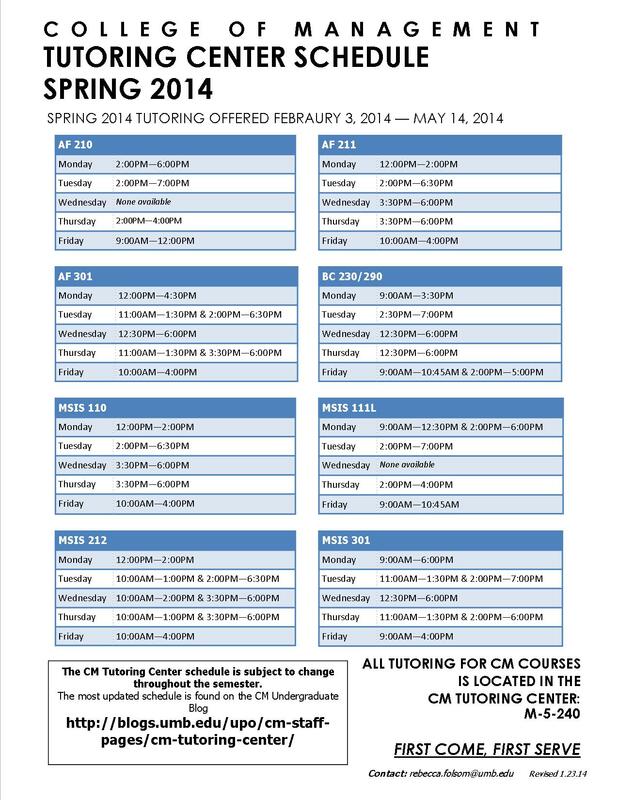 Spring 2014 tutoring will be offered by the College of Management beginning on February 3, 2014, and ending on May 14, 2014. To view more information about the tutoring center, please click here. The schedule for tutoring is attached below. 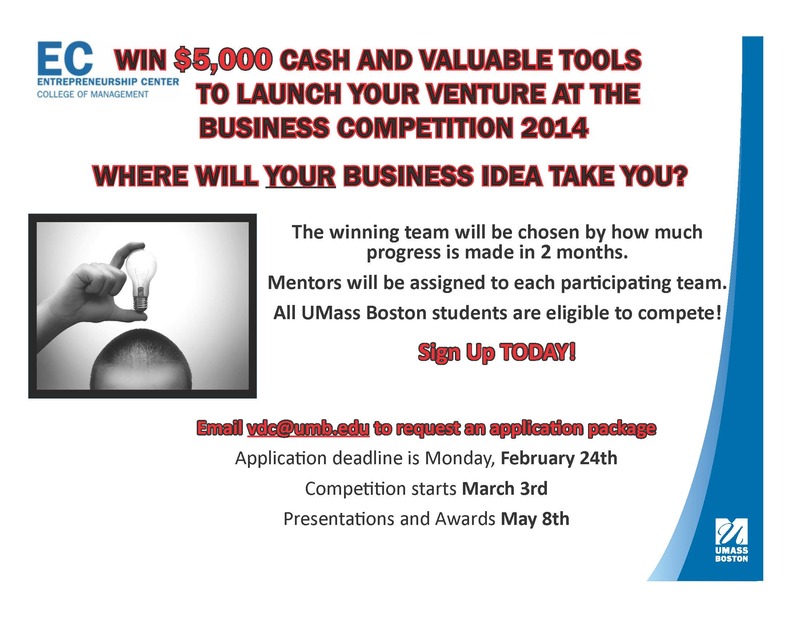 Email vdc@umb.edu to request an application package today! Comments Off on Frozen Fenway Tickets Available!! 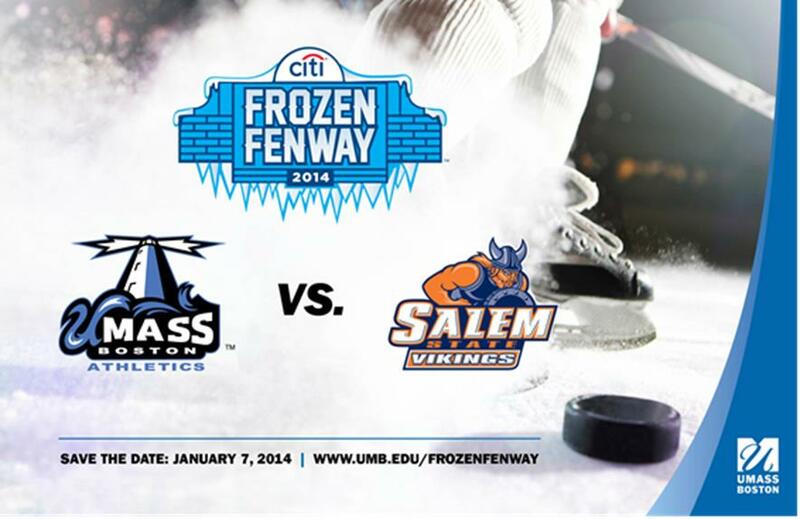 CM has some extra tickets for the Frozen Fenway Ice Hockey game this afternoon at 4:00pm if you are looking to go. First come first serve in the CM office while supply lasts!